More than 305 million people visit U.S. national parks each year. The National Park Service reports an average of 160 visitor deaths annually. Those are pretty good statistics, but they could be lower. And the types of injuries and fatalities reported in these parks can happen to anyone in the great outdoors, whether hiking, camping or participating in outdoor sports. The best way to avoid injuries in these settings is to plan and prepare well. Choose activities that match the experience and skills of everyone involved, Gather information about weather and the environment prior to setting out and ask about specific hazards in the area upon arrival at your destination. And, of course, always follow the posted rules and regulations. Use of the buddy system can also go a long way in lowering the risk for injury or death: two sets of eyes and ears are better than one. Drowning is the most common cause of death in national parks. Sadly, drowning while swimming incidents have increased every year, from 32 in 2007 to 59 in 2013. Boaters, kayakers and rafters also account for many drownings, while fewer than 10 resulted from rip currents. Vehicular accidents in national parks, surprisingly, account for the second most frequent cause of death in national parks. The National Park Service reported 143 fatalities between 2007and 2013, despite the lack of heavily trafficked roads. Reckless drivers exist everywhere. Six of the accidents involved bicyclists, seven involved pedestrians and 42 of those who died were on motorcycles. Severe weather conditions such as gusting winds and flash floods cause the fewest fatalities – only eight from 2007 to 2013. However, other environmental factors played a role in deaths. Exposure to cold or heat, avalanches, and rockslides are examples such causes of fatal incidents in the wilderness. Advance preparation and knowledge of existing hazards can prevent being caught in dangerous conditions. Slips/falls by hikers resulted in 169 deaths in national parks between 2007 and 2013. People falling over cliffs, from trees and rocks, over waterfalls and down slippery slopes are all too common incidents that can result in serious injury and death. Likewise, slipping in streams or on trails covered in wet leaves and brush are the cause of many injuries. Wildlife sightings are a big draw for visitors to parks and other outdoor areas. Unfortunately, the animals aren’t usually quite as enamored with their human visitors. The most common cause of death by wild animal is attack by grizzly bear. Other animals that commonly present a risk are mountain goats, boars and snakes. Poisoning by carbon monoxide, drugs, alcohol and toxic plants are very rare, but do occasionally occur. We reported in our prior blog posting, New National Parks Outfitters & Guides Requirements , that the U.S. National Parks Service increased the General Liability insurance limit requirements for rafting companies in Grand Teton National Park from $500,000 to $5 million. However, due to an outcry from industry participants, the National Parks Service later backed off this position and dropped the required limits to $2 million. Now, a similar outcry from small outfitters, guides and insurance experts has caused the National Parks Service to suspend its plans to increase the aggregate liability insurance limit to $5 million for whitewater boating outfitters in Dinosaur National Monument. It also backed off the requirement to carry pollution coverage. In protest, Whitewater outfitters and guides claimed that the higher limits would raise premiums by 60 to 80% and that pollution coverage was not warranted. Many of our sports and recreation clients often find themselves in areas where there is potential for feral dog attacks. With your safety in mind, we have compiled a list of our top tips to help you protect yourself in the event of an attack. American love their pets! So much so that 39 percent of households in the U.S. own at least one dog and 75 percent of those dogs are spayed or neutered. Despite the number of responsible pet owners, the number of feral dogs roaming among both rural and urban areas is increasing. The past decade of economic instability has forced many shelters to turn away pets whose owners can no longer afford to care for them. In Detroit, the solution some dog owners found is to allow their animals to roam the streets as a means of supplementing their diets. These dogs tend to form packs. This proved such a danger to postal carriers that consideration has been given refusing mail service in neighborhoods with proven records of feral dog attacks. Rural areas have proven to fare no better in the fight against wild dogs. The pack mentality is such that it has allowed these animals to team up and kill livestock to the tune of some $37 million annually. 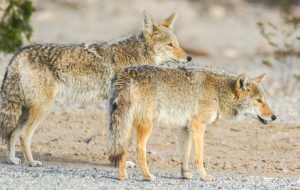 While some farmers have banded together in an attempt to eradicate these feral packs, there is no sign of the problem going away. Making eye contact is viewed as a challenge. Standing directly in front of a feral dog is considered an attack position and only serves only to increase their aggression. Stand off to one side instead. Running invites dogs to give chase. Animals are acutely perceptive of our body language, and projecting fear sends send the message that you are weak prey. Turning your back leave you totally vulnerable. Carry repellant and/or a weapon (baseball bat, large stick, knife, etc) when walking Not only will this serve as protection, but it can also be used to distract the animal should an attack occur. Remain calm and stay in command of the situation. Hold your position. Waving your arms around and shouting isn’t a guaranteed method of intimidation. In fact, it’s an invitation for the dog to bite you if it’s feeling threatened. Find higher ground Whether you can climb a tree or a dumpster, get out of their reach. If you can’t get away or distract the dog with an object and the dog attacks, gouge an eye. A blow to the throat also works well. Another strategy is to curl up into a ball on your stomach and use your hands to cradle your neck as protection for your most vulnerable areas and try to remain still. it may help to end the attack. Based on our experience in insuring archery and hunt clubs, falls from tree stands represent one of the biggest lawsuit hazards along with ATV accidents. 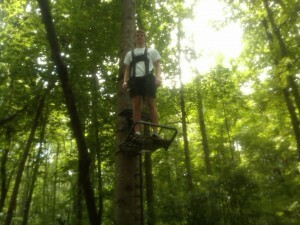 I recently set up a manufactured tree stand with my son, as shown in the photo. We were amazed at the detailed safety instructions explaining all the different things that could go wrong in the set up and while actually hunting. Evidently, every manufactured tree stand of this type comes with a body harness that should be worn at all times and attached to the tree by a climbing belt or a tether. If these safety recommendations are followed, a mishap should never result in a fall where the hunter hits the ground. But, I had no idea that a hunter who falls and remains suspended in the air by the tether can quickly become unconscious and die due to blood pooling in the legs (with the body harness wrapped around legs). Note that in the picture, my son’s tether was not attached high enough on the tree. I guess that’s why you should read the instructions and view the DVD before assembly! It scared the heck out of me. 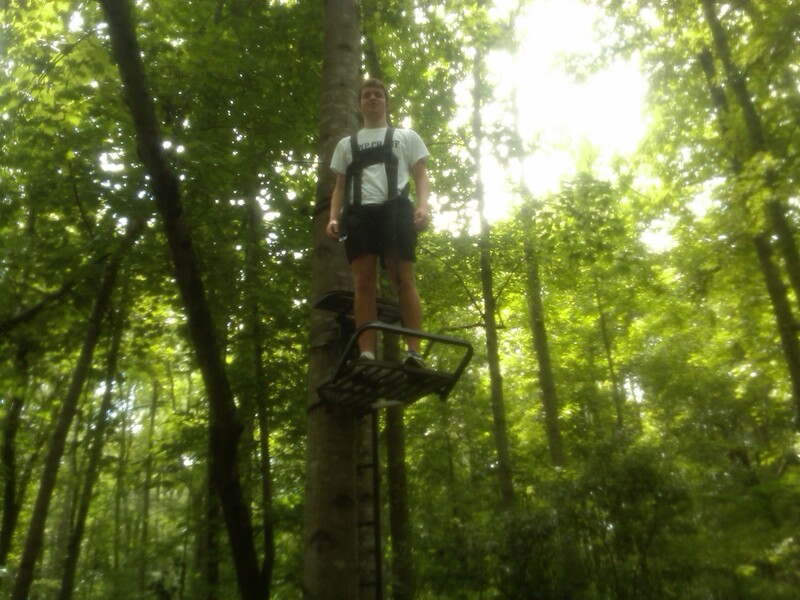 Tree stand safety is serious business and the industry has responded with appropriate warnings and education. I have a better understanding and appreciation of the risks faced by my archery insurance and hunt club insurance clients. The U.S. National Parks Service recently increased their required General Liability limits for outfitters and guides from $500,000 to $5 million. 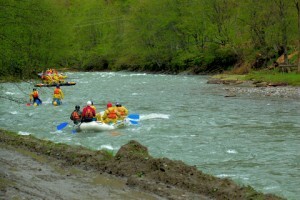 The requirements were first implemented in 2010 for rafting companies operating in Grand Teton National Park. However, NPS may begin implementing these requirements nationwide. Nationally, the NPS manages some 515 small business operators at 130 parks with the majority generating less than $250,000 in annual revenues. Outfitters and guides ar e typically small businesses that specialize in taking customers on outdoor adventure trips, including rafting, kayaking, canoeing, fishing, biking, hiking, and mountain climbing. NPS hired Price Waterhouse and AON to review their minimum insurance requirements in order to professionalize their business practices. NPS consultants stated that $1 million is appropriate for low risk businesses. However, high risk businesses such as outfitters and guides conducting back country operations should carry a limit of $5 million. According to an AON report, business operations that simultaneously expose multiple persons to serious injuries should carry a limit of at least $5 million. Such a limit is appropriate for most river rafting guide businesses. The new liability levels required by the NPS will restrict the activities in the parks and the people enjoying such activities. According to Jim Lynch, an independent actuary hired by AOA, the insurance requirements of other federal organizations, including the Bureau of Land Management and the U.S. Forest Service only require limits in the $500,000 to $1 million range. Claims that reach the $1 million limit are rare. The new NPS requirements could reduce the number of commercial outfitters and guides or increase their cost of doing business to a level which may cause adventure seekers to “go it alone” without the help of professionals and thus increase the risk of injury. Rick Lindsey, an insurance executive who insures outfitters and guides said his company has yet to see a claim that approached $500,000 and that in his 30 years of experience a $500,000 limit has been more than adequate. He stated that the expense of carrying the higher limit would drive some outfitters and guides out of business. Several insurance experts and insurance carrier representatives were interviewed on market availability and cost of the $5 million limit. Contradictory testimony was presented to the committee. Some stated that such limits were unavailable from insurance carriers and others said they were available but very expensive. One insurance agent stated that it was extremely difficult to find a carrier willing to write outfitters and guides operating on rivers rated above class 3. Concerns were also expressed that only the larger commercial outfitters and guides could afford the higher limits and that the smaller operations would be forced out of business. In addition, one expert stated that a hard insurance market could result in extreme rate hikes and the inability to purchase $5 million limits. The subcommittee recessed and will take up the matter at a future meeting. 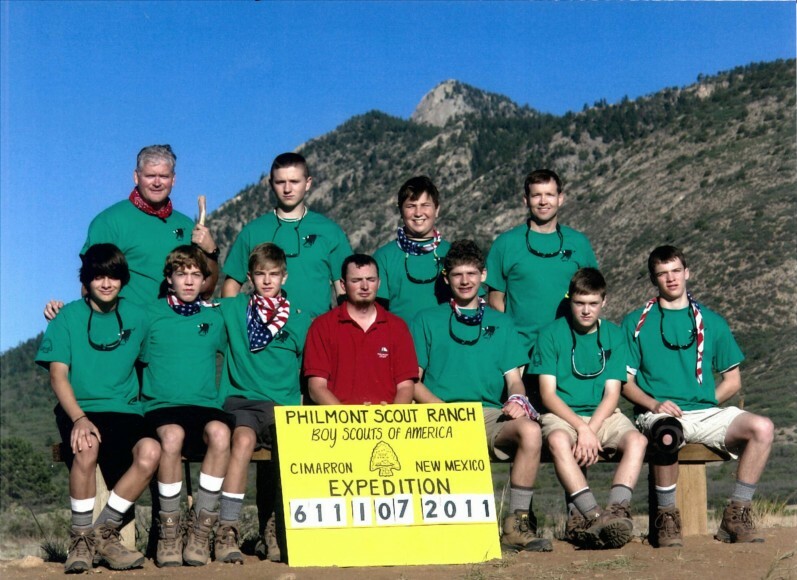 I was one of two adult advisors for a crew of eight scouts, including my son, who attended the Boy Scouts highest adventure camp at Philmont, New Mexico from June 10 to June 23. 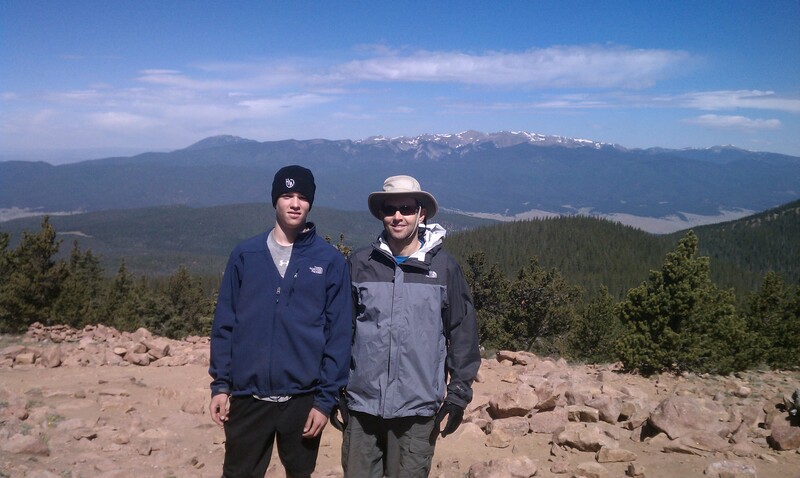 Philmont is known as a camper’s paradise with its many miles of mountainous trails and beautiful vistas. We hiked Itinerary 11 over a ten day period for a total of 56 trail miles plus many additional miles logged around the campsites. 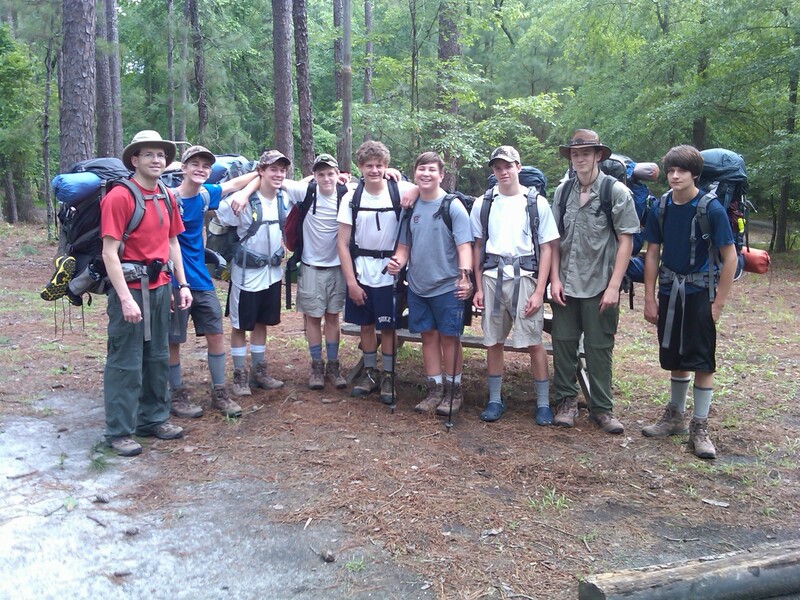 Each day consisted of a hike between 2 and 9 miles as well as fun programming upon entry into a new camp. We carried all of our food, water, and gear and slept in our tents every night except for one where we slept on an Adirondack. The first two days on the trail were training days under the supervision of ranger, Cody Nelson, where the boys learned skills such as map reading, lightning safety, bear safety, first aid, purifying water with Micropur tablets, hanging bear bags, going to the bathroom in the wilderness, cooking and cleaning Philmont style, and principles of leave no trace camping. Programming at campsites included activities such as GPS training, search and rescue, tomahawk throwing, blacksmithing, homesteading, panning for gold, mining, black powder rifle shooting, horseback riding, rock climbing and rappelling, fly fishing, and a conservation project. From my point of view, I was able to keep up with the young bucks (14 and 15 year olds) in terms of strength and stamina; however, my flat feet took a beating from day one. My old nemesis, plantar fasciitis (heel pain), began to creep in prior to the trip as a result of the purchase of a new pair of “stability” running shoes a month and a half prior to the trip. Probably should not have purchased the “stability” version of the shoes since my custom orthotics already correct for ankle pronation and the end result was overkill. The steepness of some of the trail inclines (along with the 45 lb pack weight) shredded my heel fascia and arches. Pain is one thing, but I suspected a tear in my heel fascia on the day 7 hike. By day 9 out of 10, I knew that I risked long term injury and possible surgery (after a cell phone call to my podiatrist) and as a result requested to be replaced by a Philmont Ranger for the last day of the tour, which was a strenuous, steep, and rocky hike over the Tooth Of Time. Getting enough sleep was not a problem as 8 or 9 hours was the norm. Once the sun went down, the chilly mountain air provided incentive to immediately hit the tent for the warm sleeping bag. The modern air mattress is much more comfortable than those in the past. Mine is a Thermarest Neo, which is surprisingly lightweight and thick with ample padding. I also used earplugs to cut out the distractions of the boys chattering and the constant flapping of the tent in the wind. Also, without the earplugs, I would constantly wake up every time a stick broke or a raccoon screeched. There was the constant fear of a bear entering the campsite even thought we never saw one the entire trip. We did see frequent bear droppings. But…..that is why I took bear pepper spray with the handy glow in the dark trigger for quick access inside a dark tent. BSA would not allow a pistol at Philmont. Interestingly enough, no one in our crew seemed to notice the effects of the thin air at altitude on our hiking performance. 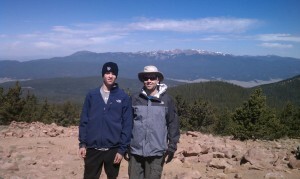 We were told that hiking at altitude would be much more difficult than hiking Table Rock in SC or the Appalachian Trail. Also, Philmont was in the middle of a drought with less than one inch of rain since the first of the year. We never had to use our dining fly and only experienced about 30 minutes of light drizzle over the two week period. The downside was the frequent dust storms with the high mountain winds that seemed blow about 25% of the time. On at least two nights, it seemed as if the wind would blow our tents down. The noise was tremendous but the Kelty tents held up well. In addition, there were no smoke complications from the massive forest fires in Arizona or from smaller fires in New Mexico. Our crew faced high altitudes (6500 to 11,500 ft) and the resulting dangers of dehydration and altitude sickness, high winds which frequently gusted over 40 mph, cold temperatures, hot temperatures, dust storms, blisters, and concerns over potential bear and cougar attacks. The boys bravely ate all of the freeze dried food and we purified our own stream water at many campsites. At one campsite, we saw an elk carcass, which was likely the result of a cougar kill. At another campsite, we saw professional trackers and dogs that were chasing a cougar that was stalking counselors the night before. Made you think twice about leaving your tent in the middle of the night to go to the bathroom. My mom and wife should be proud that my son and I hand washed our own clothes with an old fashioned bucket and corrugated metal scrubbing board. Environmentally friendly Camp Suds soap doesn’t seem to produce any significant suds and the clothes were never completely cleaned as the waste water always remained dirty after several cycles but the clothes at least felt and smelled clean. We were also taught how to wash clothes in a 2.5 gallon glad bag but never had to resort to that. Also discovered that I actually like tuna served out of a bag (never was brave enough to try it before due to the smell). This was a great experience for the boys (young men) to overcome the physical and mental challenges. The boys had to manage multiple deadlines and time lines to complete tasks with all the scheduled programming and rules about putting up bear bags before leaving the campsite and bed. It required a lot of mental discipline to remember to access all personal bear smellables (ex: medicines, band aids, lip balm, sunscreen, etc.) before the bear bag went up. If you forgot, it was too bad as it was too much trouble to lower the bear bag again. We probably should have made better use of the smaller and lighter “oops bag” that was recommended for this very reason. We heard stories about some of the other scouts having a bad attitude and dropping out. 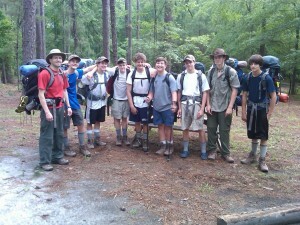 However, I can honestly say that our group of scouts was fantastic and there was a never single complaint. Philmont should recognize that the “Philmont way” of cooking and cleaning takes too long and is too labor intensive. Once our Ranger left after two days on the trail, we reverted to our own style of cooking and cleaning. Instead of cooking in a pot and later cleaning the pot and eating bowls (Philmont style), we did all of our cooking in the food bags in which the freeze dried foods were packaged which merely consisted of pouring boiling water into the bags and letting the food hydrate. After hydration, half the contents would be poured into an eating bowl surrounded by a one gallon plastic bag. One person would eat directly out of the original bag and the eating partner would eat out of the eating bowl surrounded by the plastic bag. This was a very efficient system with absolutely no washing of pots (did not use them) or eating bowls (were surrounded by a plastic bag that was disposed of). The freeze dried food was surprisingly tasty. All other foods required no cooking and could be eaten directly out of the bags. There was an ample supply of trail mix, breakfast bars, peanuts, Oreos, energy bars, etc. Another thought is that some of the bear smellable procedures may be overkill. Sure, it makes sense to put up all food in a bear bag and to not take anything into a tent on which food may have been spilled. However all the rules about the non food smellables such as not using toothpaste or liquid skin after 5:00 PM seems a bit ridiculous. Also many of the rules are contradictory. For example, extra batteries are considered to be smellables but its ok to have a battery in your cell phone or flashlight? It’s my thought that BSA has developed a risk management strategy to protect against potential liability resulting from a bear attack. They have created so many rules about smellables and have set the standard of care so high that it is unlikely that anyone can comply with 100% of them. Thus, BSA has a built in legal defense as it could always prove at least some violation of the rules. Overall, it was a great experience and BSA did a fantastic job with the training, facilities, and programming. Also, much thanks for the help we received from the local Indian Waters Council (Ranny Keys), Troop 10 officials, adult advisor Duncan Watson, coordinator Clif Kitchens, Charles Black, the staff of The Backpaker, and the many parents who provided their support and expertise. This was definitely an experience that I will always cherish with my son and I know that the boys have benefited from it in many ways that they may not even be aware of at this time. My father, Jack Sadler, often said that his scouting experience helped him to survive the harsh conditions in World War II. The hunter in this video had no idea what he was in for when he went deer hunting! I wonder what kind of hunting liability insurance this white tail carries? Fishing Liability Insurance could be just the thing that keeps anglers from being banned from their favorite fishing spot. So says Ken Maurer in his report, “Anglers Get Railroaded, Often by Stupidity.” Apparently the parking area/access point to a popular fishing spot on the Susquehanna River known as “The Poor House” is owned by Norfolk Southern. Norfolk Southern has begun cracking down on trespassers, requesting police enforce fines for people trespassing on the property. Norfolk Southern ha s a point because of the claims that they must see come across the risk management desk. However, there are compromises that can be made. My suggestion would be for a representative from the fishing clubs to approach Norfolk Southern about using the property. The clubs should have insurance policies, and the standard liability limits are $1 million per occurrence with a $2 million aggregate. These aren’t expensive policies and Norfolk Southern can be added as an additional insured on the policy. Club members could also be required to sign waivers that could be kept on file. Such agreements are common among those using the property of others, especially corporate or government owned. Such an arrangement would also protect the club itself in the event of a lawsuit. Frivolous lawsuits happen every day and it often isn’t until after something has happened that outdoor clubs realize that they need coverage. 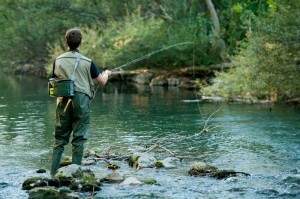 If you have questions about Fishing Liability Insurance, please call 800-622-7370.